Pye Parr is probably, inadvertently, the droid who inspired this blog. It is he who has the unenviable task of covering all that glorious artwork with logos, barcodes and other necessary evils! However, the logo and branding, as this article will point out, is an art form in itself. An art form that must be recognisable, functional and adapt to any and every cover image on which it sits, a damn near impossible task! I asked Pye to give us an insight into his creative process behind the extremely daunting task of changing such a beloved icon and he certainly didn't disappoint! Over to Pye-01 to tell us more. 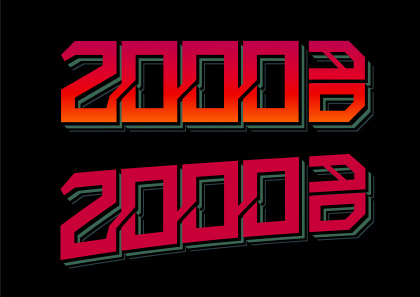 "I've been thinking (and worrying) about changing the 2000 AD masthead for quite a while now (I was sick of looking at the old one). 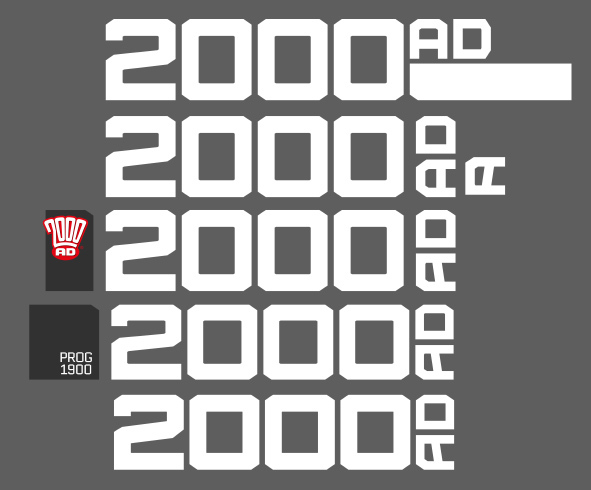 A couple of years ago I did some cover type for Prog 2013 which I was kinda pleased with, so I made a vague stab at turning it into a full font, creating a file on my desktop I went back to every so often and tinkered with..."
"That file evolved into a terrifying sprawl of crap, as I dropped the idea of a font and started trying out stuff for the 2000 AD logo. These are the first couple of ideas, in various states of completion. I still quite like the shape of the 2 here..."
"Even as I was doing these I knew they weren't going to work. The characters were just too complicated to be useful, but I finished some versions off anyway just for my own satisfaction. 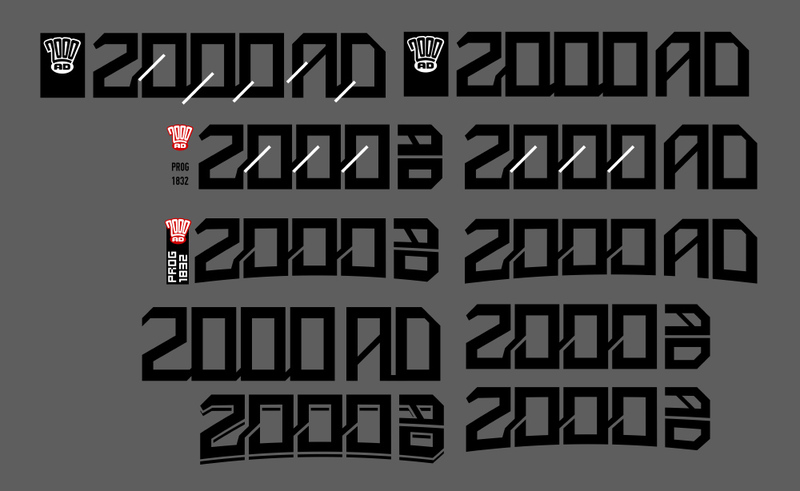 I wanted to see if I could ape some of the bends and shadows of the old logos. Not sure it adds anything really. Plus, I wanted to do something new, not hark back to an older version." "I started simplifying the letters, tweaking height and weight, and ended up with something I tested on the 2000AD sci-fi special that came out this Summer. 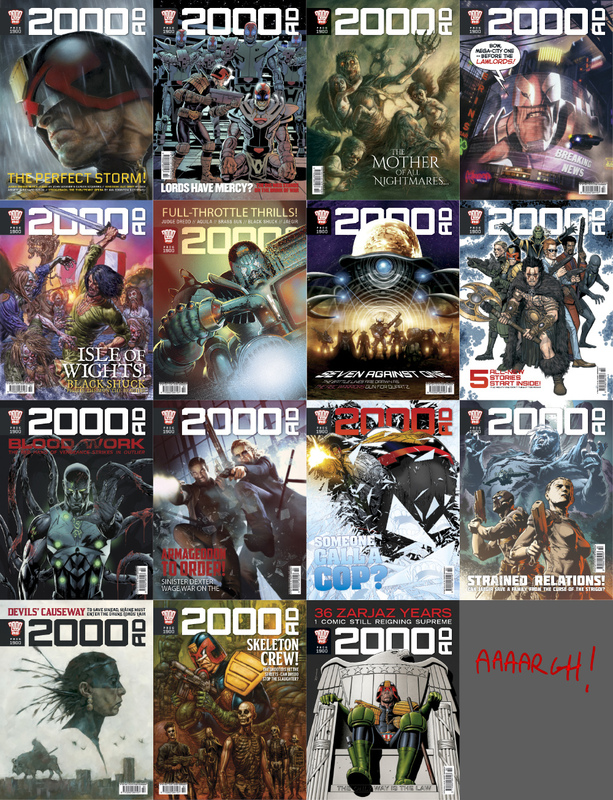 I also started thinking about ways to use the 2000 AD badge as a kind of catch-all publishers thing, like marvel or DC use their logos on batman comics as I'd done this on the US-style Dredd and Brass Sun comics and quite liked it." What's that comic called again? "After a bit of feedback on the sci-fi special, and some time to stare at it, I went back and changed the characters again. The Sci-Fi Special logo was ok, just not elegant enough somehow, so I went back to it again and changed all sorts of minor details, like the angle/size of the corners and crossbars, and adding serifs on the characters. The first time I felt I was getting somewhere was the bottom version in this pic." "First tests on logo placement. I went back over the last 10ish progs and redid the covers exactly as they were but with the latest version of the banner. 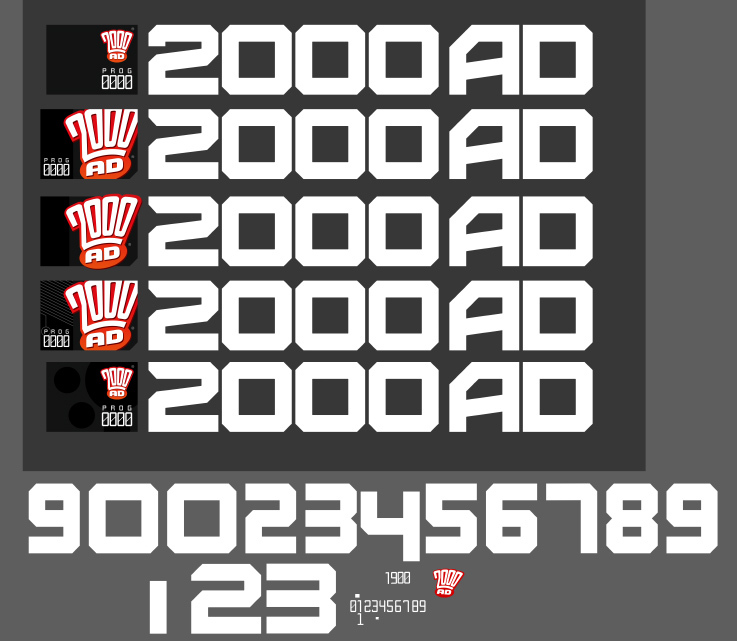 It doesn't look like much, but slight changes in the boldness or width of the type really affect how much space is left for the 2000AD badge, so I did quite a lot of mucking about here. At this point though I was still quite set on having the badge much smaller and sticking the prog number underneath it, all within a box so you could flick through a pile of issues quickly and find the Prog you want." "After a meeting with Matt, Ben and Jason we decided to drop the prog number from the banner. The badge was too small, and no matter how I laid it out it was needlessly fussy. The small type interfered with the overall look of the masthead, plus I couldn't decide what text from the barcode info to split off from the barcode box. Prog number? Date? Price? All of it? Here's some of the options I came up with. The problem with most of these is being sure they'd be legible on some of the more mental pieces of cover art we get. I think its ok to bash/cover the logo about a bit, it can take it, but things like price and issue number you can't." "I also changed the 'AD' bit on these, as Jason felt the original A looked like an R. At the time I thought that was rubbish, but looking back he was right - as the AD is sideways it needs to be as legible as possible." "With these things in mind I made some more changes and got the final logo! Having all the silliness bashed off it makes it much stronger. If it was a logo that had to stand alone you could afford to make it more ornate or technical, but the cover art for the Prog does the hard work, so I think the masthead works if it stands out without dominating, or is so stylised it only suits certain pieces of cover art." "The new barcode box. This might seem inconsequential, but its probably the thing I'm most proud of - there's just something pleasing about it! Fitting a barcode round the art is one of the most annoying things about cover design. It HAS to be easily visible, but you don't want to give it too much emphasis or it looks fugly on the artwork. This is partly why I wanted to move the date/number/price elsewhere, so I'd be able to cram the barcode off the edge of the page. Really glad I managed to find a way to make it look pretty cool, match the internal design/logo, and stay useful and flexible." "Aaaaand the final cover in all it's glory! It helps no end that the first cover with the new logo on it was an absolute stonker. Amazing bit of painting by Greg - so much so that hardly anyone mentioned the new logo on the forums I looked on, as everyone went gaga for the art! I'll take that as a good thing! Phew, that was exhausting! But wait! There's more, lots more! 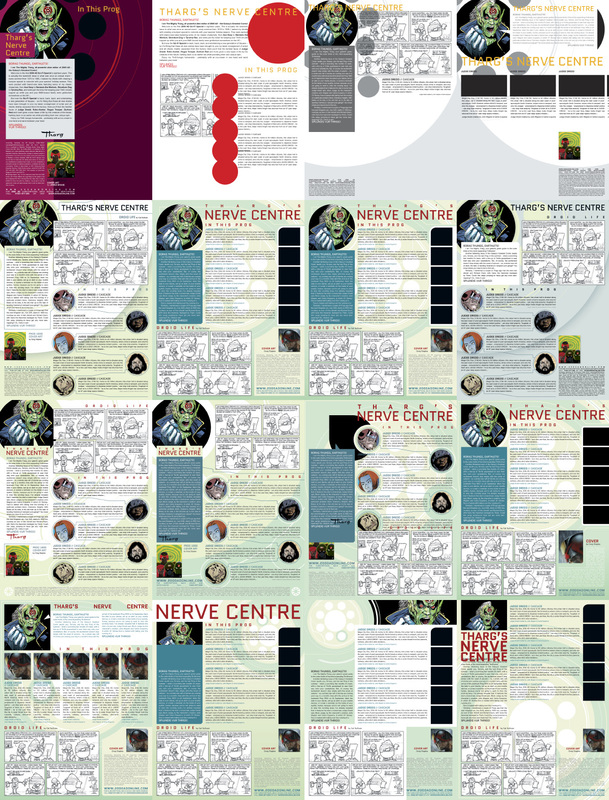 Pye also told us about his redesign of the Nerve Centre Page. 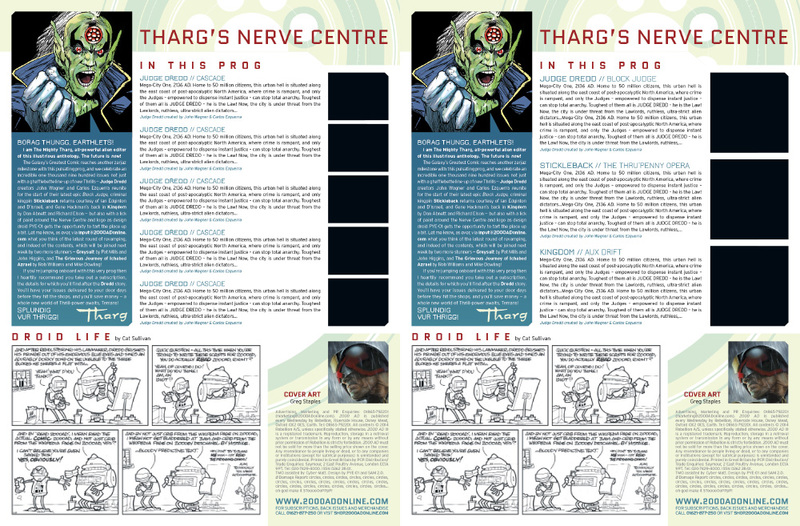 It is extremely important that he got this right as this is Tharg's page, any error here, no matter how small, would result in a one way trip to see Mek-Quake! "The New Nerve Centre. I've had an idea in my head for a little while about basing the nerve centre design around Tharg's rosette of Sirius - having Tharg peer out the centre circle, with all these concentric techy looking rings radiating out from him. 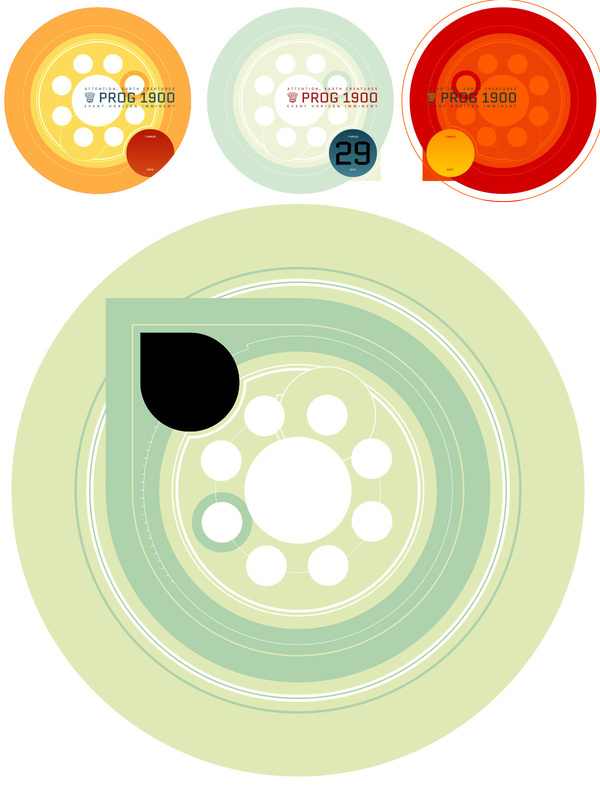 After making a rosette graphic I liked I started bashing things together in indesign. I tried for a LONG time to get the different page elements in all sorts of layouts, but annoyingly the main problem on each one was the rosette - it just made everything hard to read, so after trying it as a box, a background, squashed in the corner etc. etc. I had to kill the idea. It was driving me nuts and I was rapidly running out of time..."
Warning - If you stare at this image long enough you will get a taste for polystyrene. "The main rosette graphic. The top ones are colour test that ended up being used as Prog 1900 countdown adverts." The Nerve Centre, they use everything but the soul. "The final layout. I used the rosette as a header/footer instead. There's so much info to get on The Nerve Centre it just had to have a plain background. Like with the logo: simpler is stronger." Oh that Tharg! He's so Betelgeusean when he's mad! 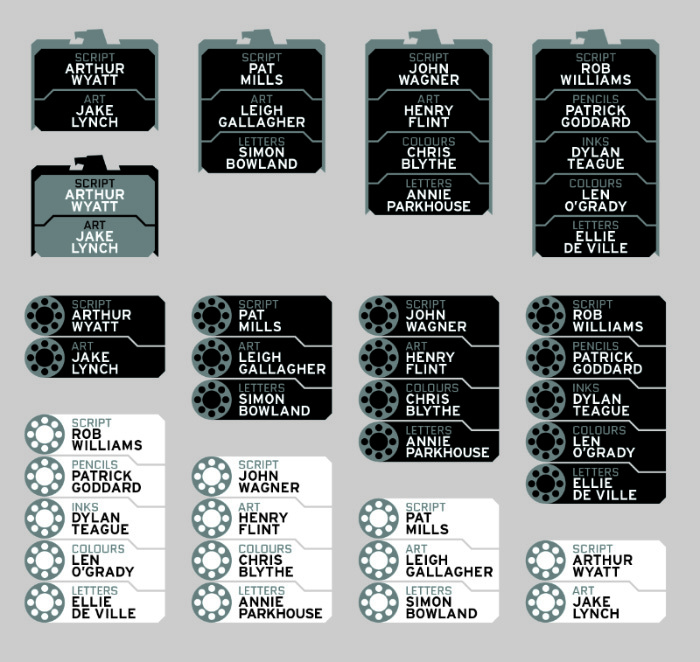 "Again on that theme I redesigned the credit boxes to match the work I'd done so far. Plenty of opportunities to customise these for specific strips too, so I'll be doing that more in future." 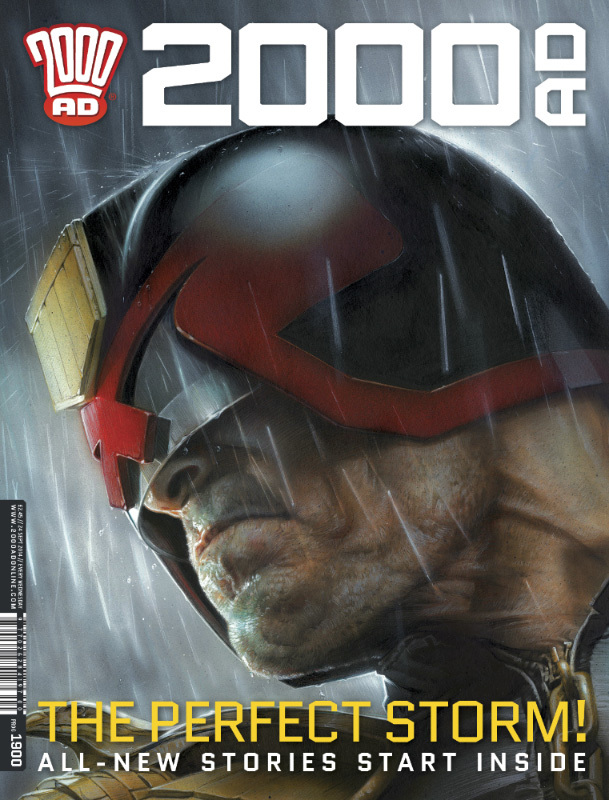 "So that's one off the bucket list, next up: A new Dredd logo..."
Wow, that's a staggering amount of work with some real thought going into it. Next time you pick up your prog, take a good look at all these extra bits and spare a thought for Pye, unsung hero of the Galaxy's Greatest! Phil Winslade - She is the Law(less)! Ben Willsher - Hot Karl! Dave Kendall - Hunter Killer! Alex Ronald - "School of Ruck!" D'Israeli - D'Sisters of D'Eath! Richard Elson - Dirty Dog!